It's true, Polka King has a new squeeze. All this time, we were wondering about him. MIA for most of the summer and totally MIA during fall, we figured something was up. I hinted at a possible Polka Queen in his future last time when he did not join us for food at Cattle Cafe. However, after finally meeting her, Polka Queen just didn't seem appropriate. Rather, we shall call her Polka Dot. Since Polka King didn't want to head into Downtown or thereabouts for food; he wondered if there were any late night joints in North Burnaby. ROFL... Yah right. Thus, we ended up heading to Joey Burnaby, which just opened not too long ago in the old location of the Shark Club. For those who didn't know, it closed down shortly after a shooting on the premises. Any type of shooting worries Polka King and I assured him that we would be safe. The only shooting he'd have to worry about is my DSLR with external flash blinding him while he eats. 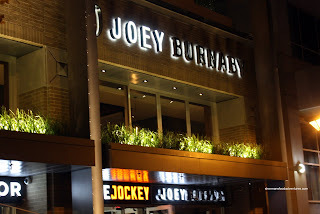 Although Joey would not be our first choice, it was in fact, one of the few options we had in this area, other than Cactus Club, Boston Pizza or Knight & Day. I can put up with Cactus Club; but no BP or K&D thanks very much. Joey has really grown up since the mid-90's. You see, it used to be Joey Tomatoes. Think East Side Mario's. It was a family-orientated restaurant primarily serving North American Italian fare. 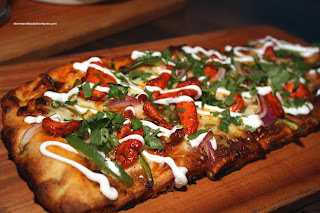 Reinvented and following the Cactus Club/Earl's formula, we now have plenty of glitz, attractive decor and staff with more upscale food (which isn't cheap). No matter, as I have stated before, we shouldn't merely discount these places just because the perceived value isn't there. 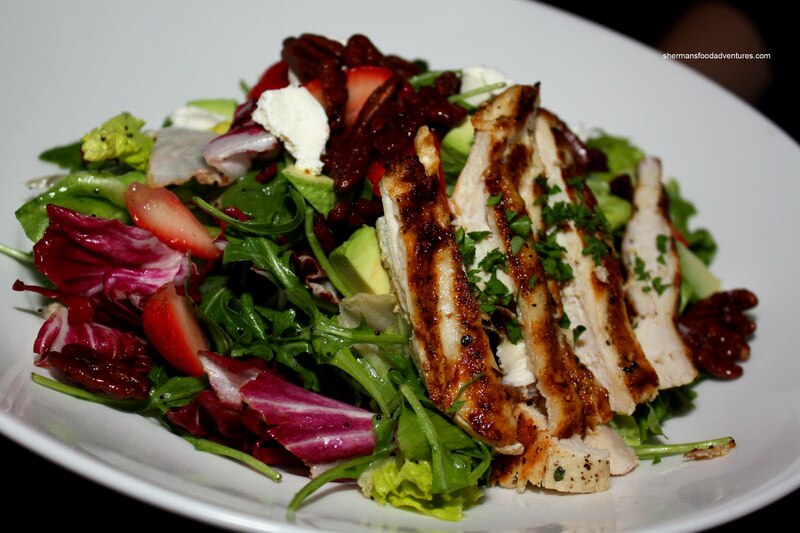 They service their target clientele and the food is only a part of the overall experience. With that acknowledgment, the food has to be at least acceptable since the place is a restaurant after all. 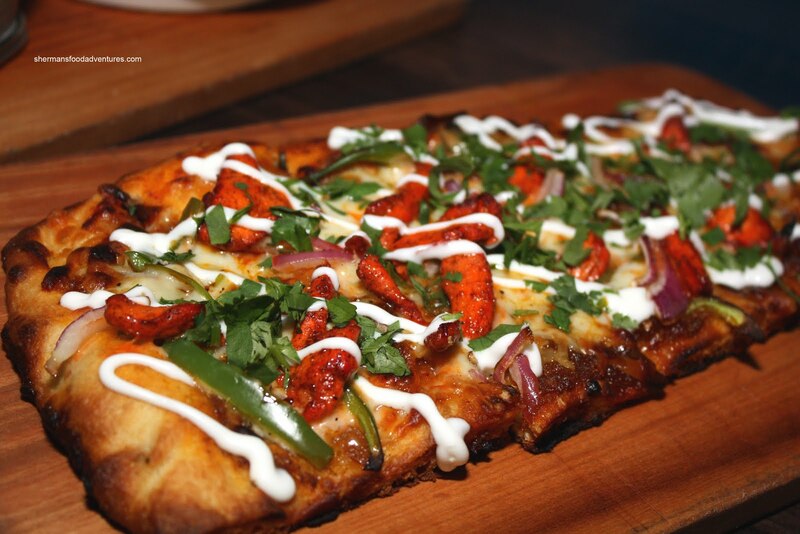 Polka King and Polka Dot ended up sharing the Tandoori Chicken flatbread and the Lobster Ravioli. Normally, I'm quite apprehensive with ethnic cuisine offered in a North American restaurant. However, the tandoori chicken was not bad. Of course it really wasn't tandoori chicken in the authentic sense; but it was tender and had a surprisingly nice kick. The bread was light and crispy. 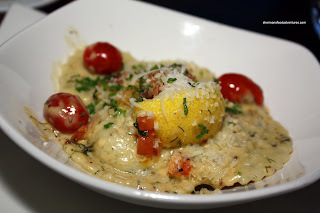 Since they were sharing the ravioli, the server had their order split into 2 smaller dishes. A nice touch. Much like the last time where Gor do enjoyed this particular dish, they enjoyed it as well. Definitely creamy. 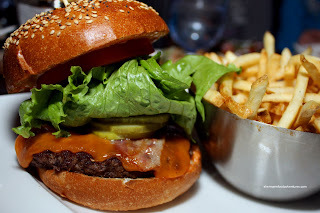 As for my food, I got the Bacon Cheddar Burger with fries. The burger was surprisingly large and actually not bad. The meat wasn't exactly moist; but the other ingredients made up for it. I particularly liked the crisp pickles and fresh lettuce. I normally like the skinny fries at Joey. This time, they were not very crisp, so I was only moderately satisfied. Milhouse, trying to watch his figure, decided on the Viva Salad consisting of roasted chicken with sundried cranberries, avocado, apples, feta with a honey balsamic vinaigrette and cilantro. According to him, a salad is a salad. However, with that established, the ingredients need to be fresh, proteins cooked correctly and a right amount of dressing. As you can see, the veggies were fresh, the chicken was a bit dry while he thought there was just enough well-balanced dressing. 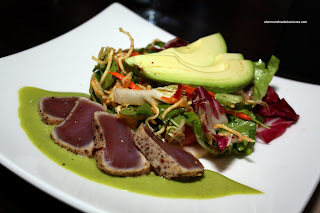 Lionel Hutz and Truditini shared the Ahi Tuna Salad with seared rare ahi tuna, mango, amorosa tomatoes, fresh mint, peanuts, crispy noodles with a chili lime d ressing. The tuna was beautifully cooked while all of the components were fresh and the dressing was just right in terms of balance and amount. 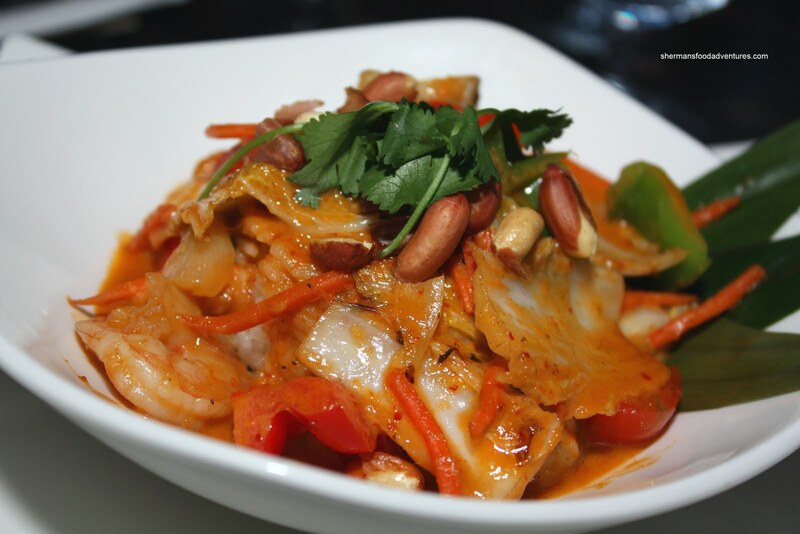 They also shared the Panang Prawn Curry Bowl with stir-fried with vegetables in a red coconut curry cream with thai basil and peanuts. Prawns and veggies were cooked properly and there was just enough sauce to taste which was not overpowering either. On another visit after hockey, I was able to try one of their more intriguing items on the menu being the Lobster Grilled Cheese. With all the strong flavours, the lobster is only a textural component of the sandwich. 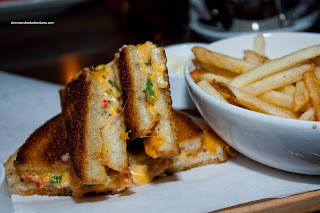 In terms of a grilled cheese, it is crispy, buttery and cheesy. However, I found it to be a bit too salty. A good grilled cheese, it just didn't need the lobster. Honestly, we were all pretty surprised at the decent eats considering Joey is a chain restaurant and there is definitely style over function. Of course not everything will be good and that is a given at any restaurant; but for the stuff we did try, it was acceptable given the venue. we've been there when it first opened because they gave the neighbourhood some free gift cards to pay the place a visit...the decor is great, food we found mediocre keeping price in mind, and parking isn't that great when trying to directly access restaurant...for cheaper and I have to say better quality food...we usually go to Milestone's across the street...I hear a Brown's is opening nearby very soon too. Went there last night, getting a bit bored of the food but for a game in the lounge its awesome. Ada said: "I hear a Brown's is opening nearby very soon too"
Yah, Joey is not awesome in terms of food, but it is very respectable for a chain. And about Brown's... I'd rather not go out to eat at all if that was my only choice. Hey you know what else is Brown? I remember back when the chain was called Joey tomatoes. How long ago did the change it? I got in an argument with my gf because I thought it still went by that name. Peter, I think it changed like 10 years ago or something like that.